Microsoft OneNote 2016 has modernized the look of the tabs to match the rest of the Office 2016 suite of applications, and has added some new features that make this the go-to application for note taking. OneNote 2016 has a modern look. Microsoft OneNote is the only Microsoft Office suite application you can download and use for free without a license to the suite or 365 subscription. The desktop application is available through the Windows Store, Mac App Store, and, of course, included in the bundled Office suite download. PC users will see newer features and improvements before Mac users. For example, with OneNote for Mac you can now draw, sketch, and handwrite notes. This has been available on OneNote for Windows since the 2013 version that accompanied the release of the Surface, Surface RT, and Surface Pro. Office Lens — Microsoft OneNote has now launched a sister application that is available on all smartphone platforms called Office Lens. This application allows you to take photos with your phone and send them directly to OneNote 2016. The application also converts images of block text or equations into, easy to read, computer-formatted pages. To utilize this extra feature locate and download Office Lens from your smartphones app store. Notes from the web with Microsoft Edge — If you are using Windows 10 and the new browser Microsoft Edge, you now can draw right on the page and clip the note you’ve created with the click of a single button in the top right area of the tool/address bar. Keep in mind this feature is not available to Mac users unless Windows 10 is either virtualized or dual booted to the Mac computer. Send notes to yourself via email — Microsoft has added me@onenote.com as a way to collect emails and send them to your OneNote notebook easily. Why? Some people keep very large email archives so that they can refer to the content as needed; depending on the number of projects you’re working on, having that information in one place might prove very convenient. To set up your email addresses to be used in OneNote, visit the email settings page and select the address from which you want to have OneNote accept incoming mail. If your email address is not shown as a selection, click the “Don’t see the e-mail address you want to add” link and follow the prompts. 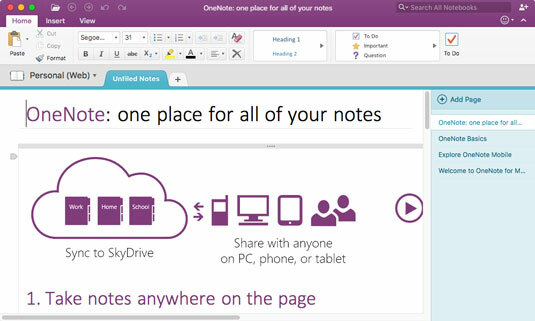 Sharing — You now have the ability with Microsoft OneNote 2016 to share your notebooks and collaborate with others on the notebooks content. Click or tap on the person icon in the top right corner of the application and choose to either email, upload, or export your Notebook. Syncing — OneNote 2016 now offers the ability to sync notebooks across multiple platforms and multiple application versions. Unlike with OneNote 2013, the 2016 version is compatible with notebooks from older versions of the product. For example, if you are using OneNote 2016 on a Windows 10 computer, OneNote Mobile on a smartphone, and OneNote 2008 on a Mac, all your notebooks will be the same on all devices. Smart Lookup — Microsoft has added Smart Lookup (aka Insights from Bing) to the OneNote 2016 interface. This means you can easily add more information to your Notebook in the form of photos, research, links, and web articles. To access Smart Lookup right-click the element on which you want to collect more data and drop-and-drag the data to your notebook. Tell Me — OneNote also includes the Tell Me function like with the other applications in the Office 2016 suite. Tell Me can help you utilize features of the OneNote application you have never used before as well as make other features quicker and easier to access and use. To use Tell Me click or tap on the search box or question mark in the top right corner and type your request. If you are specific, the application will perform the function for you. If you type a keyword it will display a drop-down list with options to choose from. For example, “Add New Notebook” will do just that, on the other hand “Notebook” will display a drop-down list that offers options like add, export, print and so on. Click or tap the appropriate option.